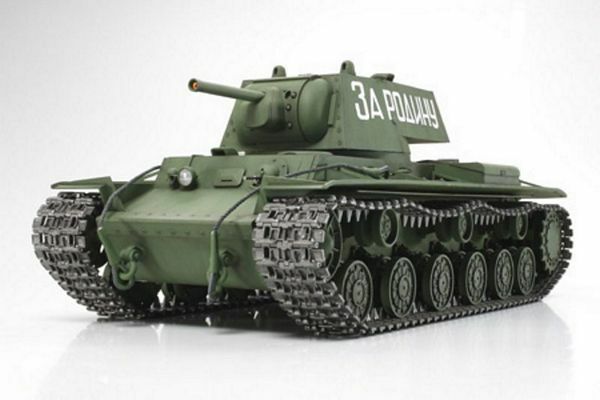 This is the TA56028 RC Russian Heavy Tank KV-1 Full Option Kit from Tamiya. Named after the Soviet defense commissar Kliment Voroshilov, testing of the KV along with 3 multi-turreted tanks the T-35, T-100, and the SMK began in September 1939. These tanks were soon battlefield tested during the Winter War from December the same year. Battlefield experience revealed the SMK and T-100's poor mobility, while the KV's good performance led to its adoption as the Soviet Army's next generation heavy tank. During WWII, the KV-1 heavy tank proved to be a difficult customer to handle for the invading German Army and forced them to build stronger and heavier tanks. This is a 1/16 R/C Russian Heavy Tank KV-1 Full-Option Set kit. Length: 423mm, Width: 210mm, Height: 170mm, Weight: 3,500g. The KV-1's distinctive form is accurately reproduced. Includes DMD Control Unit (T-08) and DMD Multi-Function Unit (MF-06) which enables turret rotation, gun elevation/depression, and realistic light and sound action at your fingertips. Install ITEM 53447 1/16 R/C Tank LED Battle System (sold separately) for exciting 1vs1or team battles with other similarly equipped Tamiya R/C tanks. Motor and 4-channel R/C system included. Battery pack and charger are separately required. This Russian heavy tank would look fantastic facing off other Tamiya 1/16 R/C tanks such as the previously released 1/16 German Jagdpanther Late Version Full-Option Kit (Item56024) and 1/16 German Panzerkampfwagen IV Ausf.J Full-Option Kit (Item 56026).